Electro Harmonix V256 Vocoder with Reflex-Tune: Robotize Harmonize…Rule the vocoderworld! The V 256 welds your voice to your axe inspiring the twist of creativity that can make all the difference. Built around the finest aspects of Electro Harmonix praised V256 Vocoder The Electro Harmonix Iron Lung Vocoder Pedal is the baby brother housed in their smallest die-cast chassis. Some of the most desired aspects from the V256 have been incorporated into this small wonder. The Big Muff Pi will give you a sweet violin-like sustaining sound. Its the same legendary sound created by Jimi Hendrix. The distortion countless guitarists and rock legends like Hendrix and Santana have relied on for its rich creamy violin like sustain. The programmable Stereo Talking Machine Vocal Formant Filter presents creative vowel shaping that is controlled by the players dynamics. The Electro-Harmonix Voice Box pedal generates 2 to 4 part vocal harmonies in the same key as the chords being played on your guitar. With the Voice Box harmonies move in a smooth human-like transition rather in steps. Electro-Harmonics offers more variety in harmonies. Electro-Harmonix adds some weird voices like a whistle male-to-female and female-to-male voices and independent reverbs on dry and harmonies. Let There Be White! 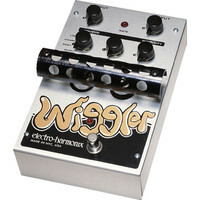 Just like its cousin the Black Finger the White Finger analogue compressor guitar pedal yields transparent long sustain that preserves attack. The Volume Pedal from Electro Harmonix is part of EHXs innovative Next Step Effects series. With no potentiometer optics or magnetism to sweep the volume control you get accurate and very expressive control over the volume of your instrument.